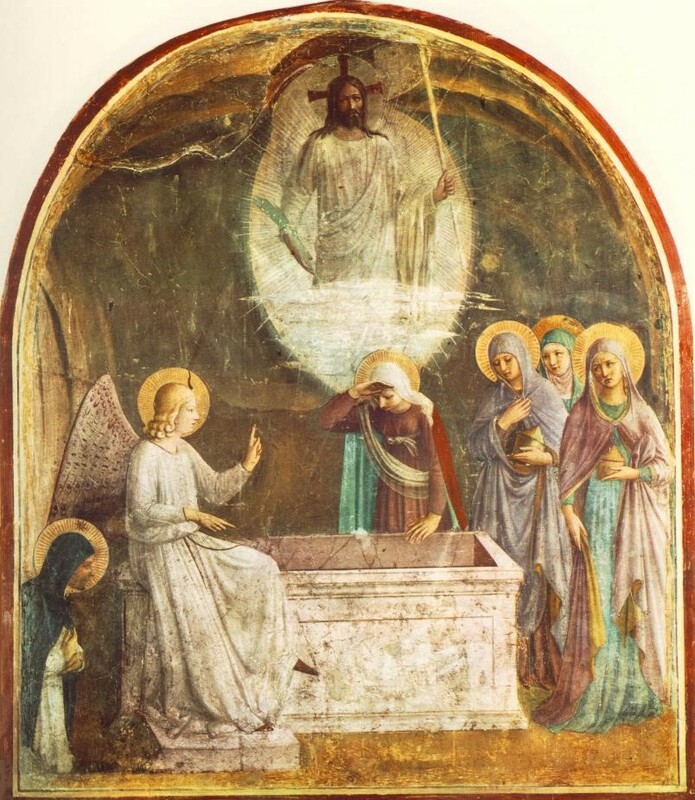 Our Lord appeared to His Blessed Mother just after His Resurrection, changing her sorrow into intense joy, and giving her in anticipation a share of the glory and happiness that awaited her in Heaven. How sweet and consoling must have been the converse of Our Lord with His Blessed Mother! How she must have thanked and congratulated Him for choosing her to be His companion in the sublime work of the world’s redemption — and for having vouchsafed her a share in His manifold sufferings and sorrows! And how Jesus, in turn, must have thanked His Blessed Mother, and praised and blessed her for all she did and suffered for Him from the moment of His Incarnation to His expiration on the cross! Let us try to picture to ourselves the overflowing rapture of Mary’s immaculate Heart when she beheld the glorified body of her divine Son. She did not go with the devout women when (as the Evangelist tells us) they went very early in the morning to anoint the body of Christ. She well knew that it had no need of the embalming spices or agents, since it was not destined to molder in the grave. She did not go to visit the tomb on Easter morn with the weeping Magdalen, for she was well aware that the tomb of Joseph of Arimathea was vacant of its divine Tenant. Already her adorable Son had visited and consoled her. And with what ecstatic joy must she have gazed on those hands and feet, lately so livid and lacerated, now shining as if adorned with dazzling jewels; on that glorified body, so horribly torn by the scourges, now resplendently arrayed with heavenly vesture; on that sacred face, once clouded by blood and bruises, now more brilliant than ten thousand suns, thence diffusing the light of the Lamb, which shall fill the New Jerusalem with ineffable delight, from everlasting to everlasting!